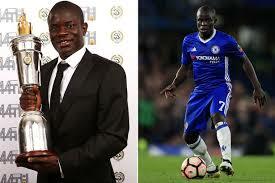 Kante crowned Premier League Player of the Season – Royal Times of Nigeria. Chelsea midfielder N’Golo Kante has been named the Premier League Player of the Season. 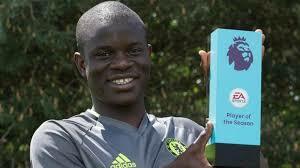 Kante won the most combined votes from a panel of experts, captains of Premier League clubs and a public ballot. He edged fellow nominees Eden Hazard, Cesar Azpilicueta, Harry Kane, Dele Alli, Jan Vertonghen, Romelu Lukaku and Alexis Sanchez to the prize. The 26-year-old has enjoyed a splendid first year at Stamford Bridge and has already been awarded the PFA and Football Writers’ Association prizes for his performances. Kante was a key component of Leicester City’s shock title win last season and has been a driving force behind Chelsea’s triumph in 2016-2017. He is only the second player to claim back-to-back top-flight titles with different clubs in England, after Mark Schwarzer, who did so with Chelsea in 2014-2015 and Leicester the following year.